Load management, in a nutshell, is a process by which the ‘peaks and troughs’ of power use are smoothed out with the aim of achieving a reduction in energy costs. Examples of money savings include: E-Car (variable charging); power storage; heating pumps used as a storage buffer; and the integration of a step-less heating element to generate hot water with PV power. Key companies in the sector include: ABB, GE, Siemens, Etap, Schneider Electric, Mitsubishi Electric, Rockwell Automation, Honeywell, Fuji Electric, Yokogawa and Wartsila. The amortisation period of a smart load management system for the consumer will of course depend on the price of electricity. However, Greenrock the provider of energy efficiency services, estimates that based on average 2018 electricity prices its Energy Management System (EMS) could pay for itself in as little as five years in Germany and 6.5 years in Austria. Its EMS stand-alone solution was unveiled at the 27-28 February Austrian Energy Show ‘Energiesparmesse Wels’. Explaining the concept, the company said, “We need most of our energy in the morning and evening hours. We have to feed our solar power into the grid and buy energy in the evening hours… The EMS stand-alone version optimizes self-consumption. Additionally, a Greenrock saltwater battery assists for even better outcomes.” The EMS provides recordings and evaluations of actual consumption, plus net feed-in of excess and actual PV production. Various ‘add-ons’ can also be integrated to the EMS. In the UK, the range of EMS suppliers offering cost saving systems include: the US headquartered, Opower, in collaboration with British power supplier First Utility; the UK based energy management consultancy BizEE Software Ltd; the Southampton based Solent Electronic Home; and the Cambridge based GEO, Green Energy Option. 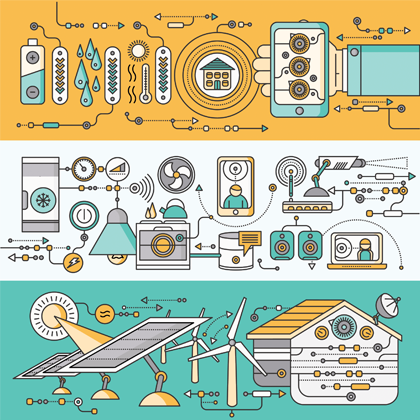 In January, Con Edison the US utility announced that it has selected Sunverge to implement its integrated smart home, demand response, energy storage and clean energy initiative. Sunverge will supply its integrated energy storage and dynamic virtual power plant platform for Con Edison’s Smart Home rate project. The pilot will combine advanced residential time-of-use energy tariffs, battery energy storage and solar PV to improve consumer and grid efficiency and reliability. The system will automatically manage power flows behind the meter to optimise the use of grid power, battery storage, solar self-generation, and smart home appliances. With the surge in e-car demand expected over the coming years, an important consideration is the ability to combine load management with vehicle charging. At the forthcoming ‘Power2Drive Europe’ event to be held in Munich this May, delegates will hear that this ability will be the model for sustainable e-mobility going forward. Some solar technology suppliers are now cooperating with manufacturers to offer electric vehicles for sale or lease. A field test in Fellbach, Germany, tested the functionality of grid management in conjunction with electric vehicles. And the Fraunhofer Institute for Solar Energy Systems (Fraunhofer ISE) has developed a household energy management system that optimizes electric vehicle charging to maximize the supply of self-generated power from photovoltaic installations. This ‘intelligent’ control technology enables the PV system to provide 86 percent of the charging power needed on a sunny day. Without the charging algorithm, it would have only achieved 46 percent. The EMS market is extremely buoyant with one recent forecast expecting it to reach a valuation of $152.8 billion by 2025, from a mere $38.5 billion in 2017. This represents a very healthy growth of more than 18.8%.The modernization of aging infrastructure along with smart cities projects are all expected to play key roles in driving the market. Asia Pacific is anticipated to emerge as the fastest growing market region, owing to favourable government initiatives in terms of tax incentives and rebates to promote the deployment of EMS.